11/14/2013 – Phoenix Ortho version 4.0 has been tested and certified under the Drummond Group's Electronic Health Records Office of the National Coordinator Authorized Certification Body (ONC-ACB) program. This EHR software is compliant in accordance with the criteria adopted by the Secretary of the U.S. Department of Health and Human Services. “We are proud to be the first Stage 2 certified EHR focused exclusively on the needs orthopaedic physicians. We are pleased that Stage 2 has recognized the unique needs of specialists with modular certification, which allows Phoenix Ortho to maintain its focus on the needs of our orthopaedic customers. With this certification, orthopaedic physicians have a highly functional alternative to generic complete certified solutions” said Paul McCune, Chief Executive Officer. 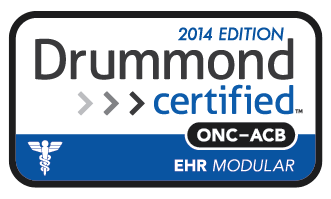 Drummond Group’s ONC-ACB certification program certifies that EHRs meet the meaningful use criteria for either eligible provider or hospital technology. In turn, healthcare providers using the EHR systems of certified vendors are qualified to receive federal stimulus monies upon demonstrating meaningful use of the technology – a key component of the federal government’s push to improve clinical care delivery through the adoption and effective use of EHRs by U.S. healthcare providers. Phoenix Orthooffers the nation’s only "Complete Ortho-Exclusive EHR." Our narrow focus delivers speed and ease-of-use that defocused, multi-specialty vendors cannot achieve. By truly integrating imaging into the patient chart, eliminating transcription expense and Improving workflow, Phoenix Ortho understands the needs of orthopaedic physicians. “This EHR Module is 2014 Edition compliant and has been certified by an ONC-ACB in accordance with the applicable certification criteria adopted by the Secretary of the U.S. Department of Health and Human Services. This certification does not represent an endorsement by the U.S. Department of Health and Human Services. This certified product-version may require a one-time implementation cost for modules pertaining to ONC Certification. Costs are based on current retail price of products and features purchased. This certified product-version may require one-time and/or ongoing monthly and/or annual costs for the Patient Portal. The Patient Portal is required to meet Provide Patient Access 170.314 (e)(1). This certified product-version may require one-time and/or ongoing monthly and/or annual costs for interface services, real-time translation of ICD-9 and CPT codes to HL7, ICD-10, and SNOMED standards. Costs are based on current retail price of products and features purchased. This certified product-version may require ongoing monthly maintenance fees for all software maintenance and software upgrades. Fees are based on current retail price of products and features purchased. This certified product-version may require on-time and/or on-going costs to establish and support interfaces for practice management systems other than Phoenix PM and/or interfaces to HIEs and similar third-parties. This certified product-version may require on-time and/or on-going costs to establish and support DICOM communication with Imaging Modalities. Costs are per modality. This allows ECs imaging capabilites for related measures. This certified product-version may require one-time and/or on-going annual costs to support electronic prescribing - 170.314(b)(3). Costs are per prescriber. Electronic prescribing is powered by DrFirst (third-party). This certified product-version may require an monthly subscription fee and/or per page fees for internet-based faxing. This fee is per line and per page. Internet-basd faxing powered by Concord Technologies (third-party). There are no additional costs or limitations for certfied features. Phoenix Ortho provides the industry’s only orthopaedic specific electronic health record solution which is adaptive, learns physician preferences, manages workflow and does not require templates. Our orthopaedic focus eliminates 100% of the irrelevant content required by all multispecialty vendors. By deploying orthopaedic specific solutions and leveraging the most progressive technologies available, Phoenix Ortho can make orthopaedic physicians more efficient while improving the quality of patient care. Drummond Group is a global software test and certification lab that serves a wide range of vertical industries. In healthcare, Drummond Group tests and certifies Controlled Substance Ordering Systems (CSOS), Electronic Prescription of Controlled Substances (EPCS) software and processes, and Electronic Health Records (EHRs) – designating the trusted test lab as the only third-party certifier of all three initiatives designed to move the industry toward a digital future. Founded in 1999, and accredited for the Office of the National Coordinator HIT Certification Program as an Authorized Certification Body (ACB) and an Accredited Test Lab (ATL), Drummond Group continues to build upon its deep experience and expertise necessary to deliver reliable and cost-effective services. For more information, please visit http://www.drummondgroup.com or email DGI@drummondgroup.com. Join our community of orthopaedic physicans, administrators and medical IT professionals and subscribe to Phoenix Ortho's Blog to receive up to date content delivered right to your inbox. Current Clients: If you are resubscribing to receive email updates, filling out this form will send you an email with a link that will allow you to manage your email subscription, allowing you to subscribe just to customer updates if you prefer. If you have any questions, please contact abrocato@phoenixortho.net.